There are two weeks of high school football left - and just two teams in Northern Kentucky. If everyone was looking forward to a rematch between Ryle and Simon Kenton, we are all disappointed. Friday night saw undefeated Ryle finally meet its match at Scott County where the Raiders fell for the first time this season, stopped near the goal line in an attempt at a two-point conversion to tie the game in the final seconds. Scott Co. won 42-40. Simon Kenton, whose only loss had been to Ryle, went down big at (Lexington) Lafayette, 63-41. Those losses eliminated all NKY teams from Class 6A title contention ahead of next week's semifinals where Ryle and SK would have faced off again. In Class 5A, Covington Catholic saw its season end at (Louisville) Fern Creek, 35-28. In Class 2A, two NKY teams faced off and Holy Cross came out on top against Newport Central Catholic, 26-21. 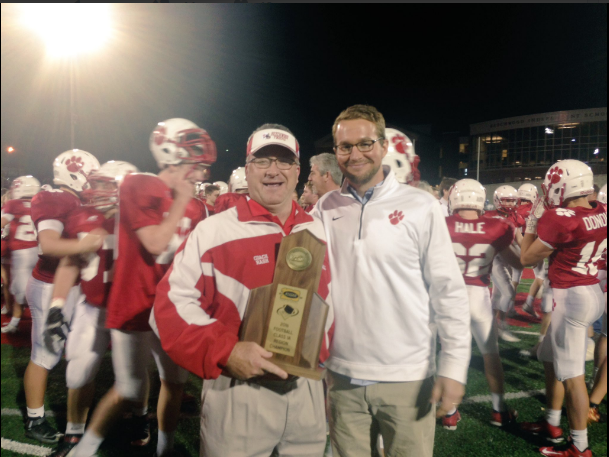 Beechwood rolled in Class 1A, beating Kentucky Country Day, 42-7. Ryle's season ends at 12-1 and Simon Kenton finishes at 11-2. Covington Catholic's season is over with a record of 9-4. Meanwhile, Beechwood extends its winning streak to 9 games and its record now stands at 12-1. Next week, the Tigers host Russellville (12-1) with the winner going to the state championship game at Western Kentucky University in Bowling Green. The game at Newport Stadium between the Indians and the Thoroughbreds was a good one. Earlier in the season, New Cath put up 21 points on Holy Cross - and that was enough because the 'Breds held the Indians scoreless. On Friday, 21 points was not enough. New Cath got off to a fast start, putting up the first score within the first four minutes - a 1-yard touchdown run by quarterback Patrick Henschen, his first of three TDs on the night. Holy Cross got on the board with a safety when Henschen threw the ball out of bounds from the end zone. A 56-yard carry would give the Indians there first touchdown, courtesy of Derrick Barnes. The game was back and forth for much of the night but Holy Cross was able to make a late stop with New Cath at 4th & Goal, to secure the win, 26-21. The 'Breds end their season at 7-6. Holy Cross (10-3) will travel to Danville (11-2) for a shot at the state championship game at WKU. RCN's Brian Frey was at the Holy Cross-New Cath game and produced the photos in the slideshow below.